The New Freaks sport the Stainless Steel Silver & Black Look. Featuring Nice Knurling and Unique Grooves. Each Model comes in 16 or 18 Grams w/ Spinners and use the 2ba Tip. 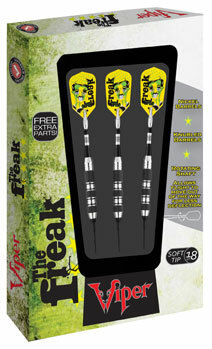 Darts come the Freak Box with accessories. Flights and/or Shafts may vary.